Women in traditional cloths enjoy the meals they have prepared using their grandmothers' recipes. Leaving your homeland is hard but being forced to leave it is harder. The memories of the population exchange between Greece and Turkey following the Greco-Turkish War between 1919 and 1922 is still fresh in the minds and a group of migrants who settled in Turkey continue to keep the traditions of their homelands alive in the best way possible - with food. The third generation descendants of immigrants who came to Nilüfer, Bursa's Görükle neighborhood in 1923 after the population exchange continue the culinary traditions of Turks in Greece. 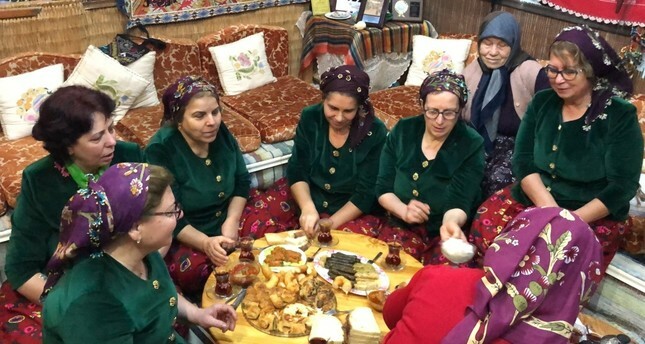 At the Görükle Women Solidarity, Development and Culture Association, women cook their traditional foods and also contribute to their families. Organizing special ceremonies like weddings, funerals and Hıdırellez events, they try to do everything in line with their customs. The women sustain the tradition of bride's offering a dessert called "gülvarak" to the groom and his family for years. Many other famous foods, such as ciğerli çorba (liver soup), borana, kaçamak, ekşili çorba (sour soup), bulamaç soup, kör pide, pita, kara erik yemeği and kapama, are always offered at their tables. President Seher Çavuşoğlu, spoke to Anadolu Agency (AA) and said that they established the association in order to sustain their traditions and customs and to transfer the past to the future. Noting that they have nearly 100 members, Çavuşoğlu continued, "What we give importance is to carry our culture to the future. We are the descendants of the population exchange. We transfer the culture that we brought with us during the exchange to the present through this association. As the association, we sustain the custom of offering lokma, a kind of fried sweet dough, and taking food in funerals. We perform our old dances with our local clothes. We organize Hıdırellez celebrations like a fair in May every year." Çavuşoğlu mentioned that they make videos to transfer their culture to the future. Implying that they sustain the phenomenon of solidarity and cooperation and often hold events, Çavuşoğlu said, "We went to the Greek villages where our families came. We pay visits to these regions." An immigrant woman spreads the dough. Saadet Atalay, 78, one of the women in the association, emphasized that her father came to Turkey at the age of 12. Atalay stressed, "My dad and grandmother used to tell me their story. People in seven villages were forced to get on a ship. There was a Greek spy on the ship, and he wanted to sink it. However, the captain caught the spy and they all prevented this from happening. There were some who gave birth during the voyage and some who passed away. The dead ones were thrown to sea." Explaining that Görükle used to be a Greek village, Atalay remarked, "When our ancestors came here, they were given 2.5 acres of land for every house. They dealt with agriculture, tobacco farming, silkworm-breeding as their main means of living." Hatice Gökaşar, 52, said that they try to sustain what they had learned from their elders and highlighted, "I prepare gülvarak dessert for women who are getting engaged. They want my help and I try to help them as much as I can." Sıdıka Çağla, 48, said that they will organize a wedding ceremony for her daughter some months later. Noting that the ceremony will be prepared in line with their customs and traditions, Çağla stated, "I have three daughters. They also want to sustain our traditions. We transfer them to our children. I hope that they will also transfer it to their own children. Therefore, our traditions will continue for centuries." In the Lausanne Peace Treaty ending the Turkish War of Independence fought against Greece and the Allied camp of the World War I, the population exchange of the Greek/Christian community in Turkey and the Turkish/Muslim population in Greece was determined without the consent of these people. Roughly 500,000 Muslims in Greece and 1.2 million Christians in Anatolia were forced to leave their houses and homelands. Immigrants were given property in return for the property they left behind. However, 110,000 Greeks in Istanbul and 130,000 Turks in Western Thrace settled in these areas before 1918 were exempt from the treaty. Apart from this, a considerable number of Greek Orthodox and Turkish Muslim people had already migrated to Greece and the Ottoman Empire due to the Balkan Wars that took place in 1912 and 1913.